Hidden away in a secluded corner of East Anglia there lurks and lingers an artistic industry which, if the opinions formed as to its origin are correct, may fairly claim to be considered the oldest in Great Britain - the craft of the flint-knappers of Brandon. Owing to an odd chain of causes it has hitherto succeeded in surviving the lapse of some two thousand centuries; but its existence is now so remarkably precarious that, failing some fresh development within the next ten or twenty years, it must inevitably disappear. 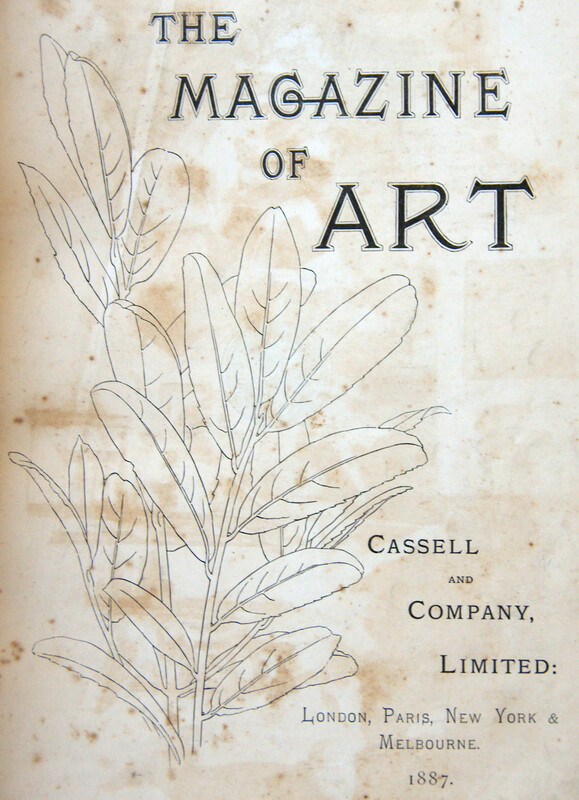 While these unconscious exponents of an antique art were still displaying their hereditary skill, and the clink of their knappers was not yet silenced in the streets of their little town, it occured to the writer to pay a visit to the scene of their labours, partly for the sake of placing on the record some of the more striking facts connected with the growth and decay of the manufacture, and partly also in the hope of administering a friendly stimulus to its failing energies. About the natural characteristics of Brandon much might be written. It is situated on a tongue-shaped strip of marshland that runs up from the great level of the Fens into the heart of the heathy district surrounding Thetford, now a decayed market town, but in Saxon times the seat of one of the East Anglian bishoprics. Brandon, before the sea retreatedThrough this region flows the Little Ouse, a bright chalk stream, here forming for some distance the boundary of Norfolk and Suffolk, to join its larger namesake a few miles below Ely. Centuries ago, geologists tell us, the Fenland of the eastern counties was very much what the Wash remains to the present day - a vast shallow expanse of salt water, with here and there a creek winding among the hills that fringed its shores. As time went on, and the rivers of the interior brought down their tribute of midland mud, this miniature Mediterranean was gradually silted up, and became a wide morass of brackish lagoons and serpentine streams, while acre by acre the sea resigned its ancient inheritance. 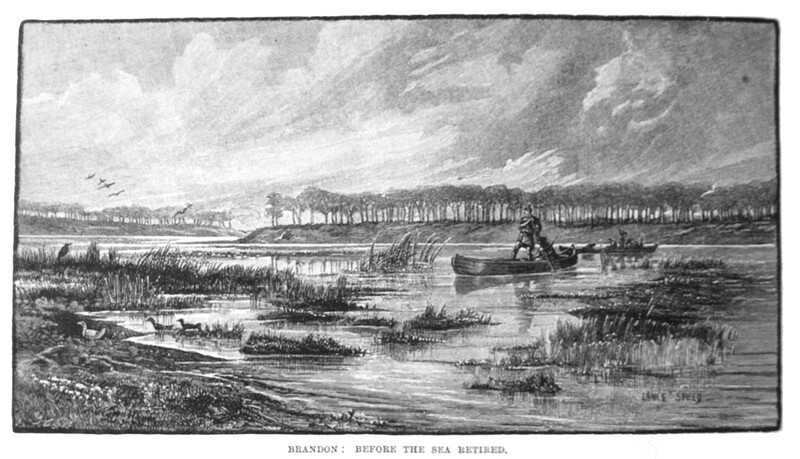 At Brandon, where the green water meadows stretch on either side of the Little Ouse, we are actually standing on an old sea bottom, and the sandy slope which dips towards us is nothing but the old sea-beach. A landscape thus composed not unnaturally presents some unusual features. From Lakenheath (the very name of which is itself suggestive) to Thetford, the railway runs through an uncanny combination of marsh and moorland scenery - a picturesque chaos in which, as in the primeval universe described by Ovid, pugnant humentia siccis [a fight between wet and dry]. Now the train skirts a gleaming pool, where reeds rustle musically, and herons are fishing, and anon it enters a sandy waste, clothed with spinneys of pine and birch, and haunted by rabbit and curlew. At one moment you are surrounded by the sleepy serenity of fat cornfields and fertile pastures stretching further than the eye can reach; at the next you are looking out upon a scene almost Scotch in its desolate beauty. 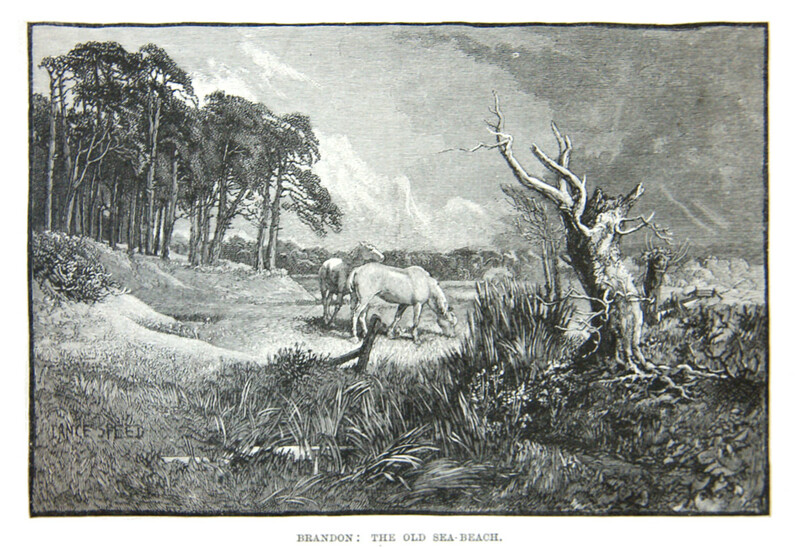 This sense of bewilderment perhaps reaches its climax at Brandon, where the nymphs of heath and fen meet, so to speak, in mortal combat. At this point you will notice starveling alders climbing to discomfort, if not to death, upon the barren sand-hills, and melancholy pines standing wet-footed and woebegone in the marsh below. Let us turn, however, to the little town itself, which, with its straggling streets of flint-built, red-roofed houses, lies in felicitous confusion on either bank of the river. A bridge of mediaeval irregularity, destined some day, no doubt, to give way to an uglier and more convenient structure, forms in the focus of its civilisation, the natural stronghold of such idleness as it engenders, and an excellent coign of vantage from which to follow with an aimless gaze the barges lazily moving down to Lynn, or the swifts that swoop and squeal about the house-tops. 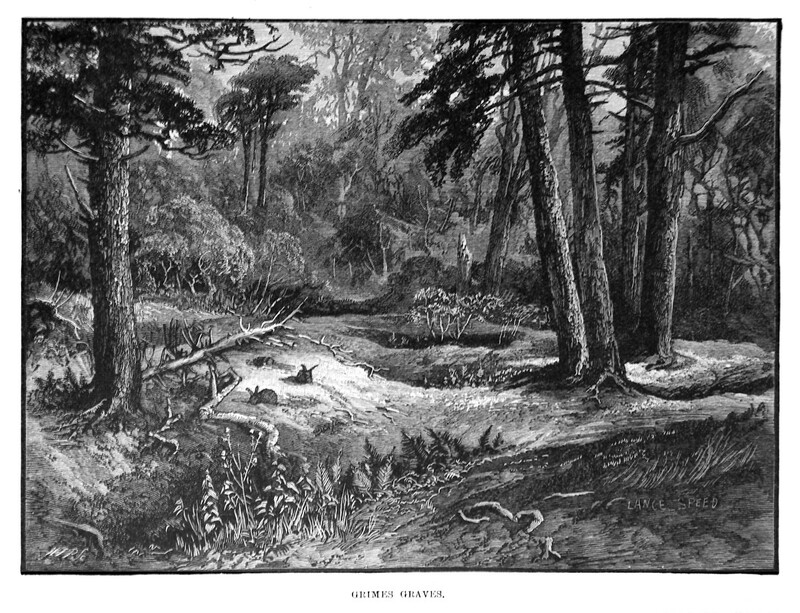 Grime's Graves near Brandon, as imagined in 1887. These neolithic flint workings are now owned by English HeritageConsidering its size, Brandon is singularly propserous and wide awake, and can boast of large saw-mills, and a flourishing trade in the preparation of rabbit-skins, which helps to keep its population employed. But its chief glory is still undeniably its flint-knapping. It is that which gives it a unique interest among the country towns of England, and enables it to look down superciliously upon the mushroom activities of Birmingham and Sheffield. As one crosses the bridge and saunters up the sunshiny street the mind goes back instinctively over the long dumb centuries from the matter-of-fact age of Iron to the mysterious age of Stone. Most of the flint now used in the manufacture comes from the Ling Heath, a large common on the Suffolk side of the river. The ground is honeycombed all over with old and new pits, and presents the appearance of being scarred by small-pox. The stone lies in well-marked strata, or "sases", of which the lowest is the most highly prized. This "floor stone" is reached at an average depth of forty feet, where the diggers are now at work, but the pit into which we descended was considerably deeper. The shaft is carried downward by successive stages, placed at right andles to each other, in a slanting direction (or, as the local phrase runs, "on the sosh"), so that by the time the bottom is reached the chalk has been under-cut something like a couple of yards. Through the solid walls burrows are then driven, radiating in a series of lyre-shaped patterns from the central opening. Jambs (pronounced "jarms") are left to support the roof, as in coal mining. 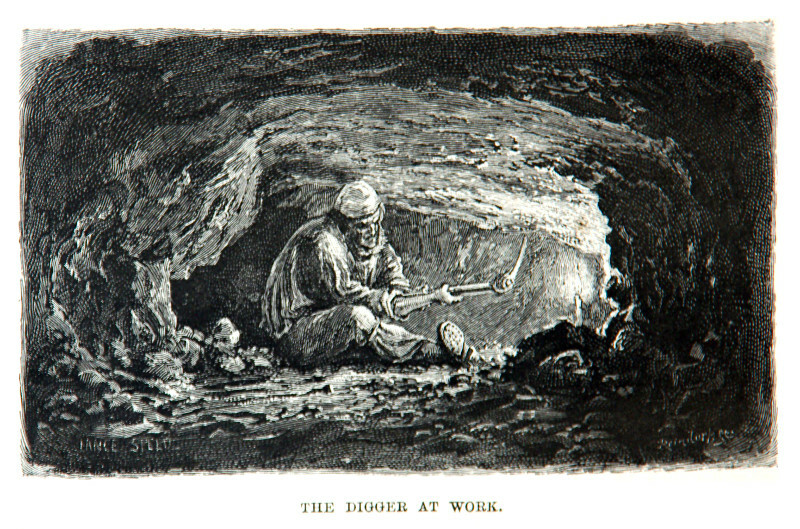 The digger works lying on his side, or sitting in the constrained posture represented in our drawing (below), by the light of a small wax candle. He uses a one-sided iron pick, with which he removes the chalk below the slab of flint, and then prizes the stone down by the help of a short crowbar. It is afterwards broken up and carried to the surface upon the head of a second workman, who deposits it on the stages left at the sides of the main shaft, and climbs up after it, repeating the process till he gains the open air with his load. Here the stone is stacked endways, covered with dried fern and fir-boughs (to prevent the sun and wind from changing its colour), in heaps averaging one ton in weight, each forming a one-horse cart-load, known in the district as a "jag". Nothing is more remarkable in the flint mining than the total absence of all labour-saving appliances, such as windlasses, or even ladders, for raising the stone. In this respect, as we shall see, the modern workman is behind his neolithic predecessors. The comparatively small number of men engaged in the business (even during its most flourishing period), and the lack of capital to pay for improved plant, must, we imagine, be held answerable for the existing state of things. Leaving the Ling Heath, bright with broom and all manner of chalk-loving plants, bugloss, campion, and the like, and picking our way among the mounds of chalk and flint that lie beside the burrows, let us follow one of the little carts that carry the stone down to the village below. As we draw near, the sharp, ringing tap of many hammers betrays the presence of the workmen, and, entering a low wooden shed, with long windows opening on to a small yard, we find ourselves face to face with the "flakers" and "knappers". Lance Speed's 1887 engraving of a flint digger at workHuge heaps of stone stand outside ready to be broken up, and still mightier mountains of waste morsels testify to their unremitting toil. Passing by the necessary process of drying the stone, when it is moist, we may regard the manufacture as falling under three heads, the two former of which may be conveniently taken together. These are "quartering" and "flaking", usually the occupation of a single workman. His first task is to "quarter" the stone, i.e., to break it up into more convenient pieces, about six inches square. He next proceeds to "flake" the flint, the most delicate and difficult operation of the craft, requiring absolute certainty of hand and nicety of aim. With hammers of various shapes and sizes the flaker strikes off strips from the whole outer edge of the stone, until only a small conical "core" remains, which is laid aside for building purposes. The best flakes run from four to five inches in length, and according as they are four or three-sided, are termed "double" or "single-backed." A good flaker will produce several thousand in a day. The third process, or "knapping", remains to be briefly described. Holding the flake or strip of flint with its face uppermost upon a "stake" of iron driven into a large block of wood, the work-man delivers a sharp tap upon its surface with a flat hammer of peculiar construction, and cuts off an oblong fragment of the size he requires. This he proceeds to trim into shape with a number of minute but nicely-calculated strokes so rapid as to be almost inperceptible. By this means he turns out, if he is a skilled hand, from 3,000 to 4,000 finished gun-flints in a single day. They range from the "Large Musket" to the small "Pocket Pistol" size, and vary considerably in excellence. The ancient beach at BrandonLarge quantities are annually exported from London to the Gold Coast for the interior of Africa, where a brisk trade is still done with the confiding aborigines. Besides the gun-flints (which now form the staple of the manufacture), a fair number of "strike-a-lights" are made at Brandon, and these possess a peculiar interest of their own, as will subsequently appear. Mr. R. J. Snare, the leading representative of the industry in the town (to whom we are indebted for much of our information), at present employs about a dozen hands all told. There are, perhaps, thirty or forty persons of all ages, including the diggers, who work independently, now earning their livelihood by making gun-flints. Stimulated to great activity during the French wars, the trade received a deadly blow from the introduction of percussion caps in 1835. Mr. Snare's father, a veteran of some eighty years of age, can remember the time when they turned out from his workshop alone every week no less than ten tons of finished flints, and paid carriage to the large amount of £30. Flint workings at Grime's Graves near Brandon, as seen in 2016We will now briefly summarise the arguments that Mr. Skertchley and others have adduced to prove the Brandon flint-trade to be a direct survival from pre-historic times. In the first place (without insisting upon the evidence of paleolithic flint-knapping which the district affords), there are situated in the immediate neighbourhood of the town some neolithic workings known as Grime's (pronounced "Grimm-es") Graves. These, until their exploration in 1870 by Canon [William] Greenwell and Lord Hill, were supposed to be a British burying-place. They are a number of rudely circular depressions, about 250 in all, varying in diameter from 30 to 60 feet, and occupying, as our illustration shows, the greater part of a good-sized spinney. The depth of the one excavated by the exploring party (which still remains open) cannot have been less than 30 to 40 feet. When the bottom of it was reached, galleries of irregular height were disclosed leading in various directions from the central shaft. 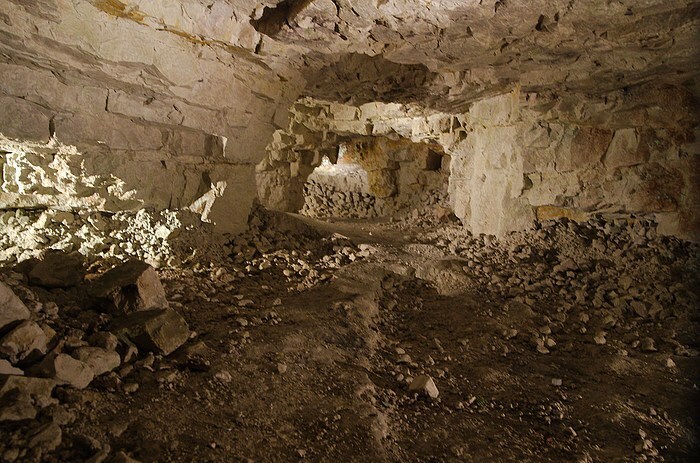 The Canon's interesting account proceeds as follows :— "When the end (of one of the burrows) came in view, it was seen that the flint had been worked out in three places... forming three hollows extending beyond the chalk face of the gallery. In front of two of these hollows were laid two picks, the handle of each to the mouth of the gallery, the tines pointing towards each other. The day's work over, the men had laid down each his tool ready for the next day's work; meanwhile the roof had fallen, and the picks had never been recovered... It was a most impressive sight, and one never to be forgotten, to look, after the lapse, it may be, of 3,000 years, upon a piece of work unfinished, with the tools of the workmen still lying where they had been placed so many centuries before". The similarities between the stone-age pick, and the modern versionA large number of these picks (of which those just alluded to actually retained on their chalky surface the impression of the workmen's fingers!) were found during the excavations, as well as sundry axe- or adze-heads, which fitted accurately into the holes in the roof and sides of the burrow. The picks were made from the antlers of the red deer (Cervus elaphus), the horn being broken off about 16 or 17 inches from the brow end, and all the tines being removed except the brow tine. 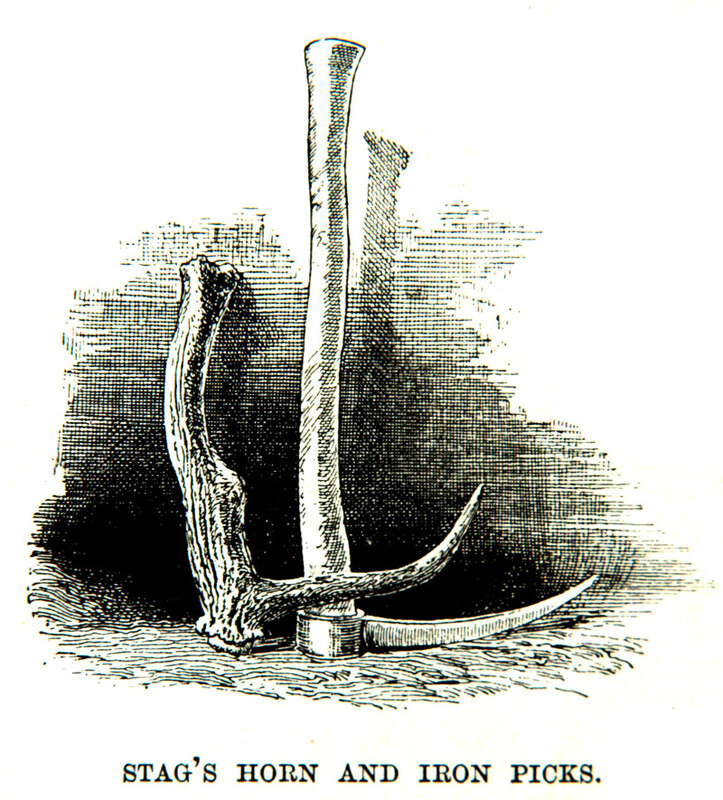 The resemblance between this implement and the one-sided iron pick used by the modern digger is immediately apparent when they are placed side by side as in our sketch, the curves of the tines of horn and iron being almost exactly identical. It is also a noteworthy circumstance, as showing the extremely local character of the industry, that all the tools used in the trade are produced at Brandon itself and nowhere else. The stone dug from Grime's Graves was probably raised to the surface in baskets, and worked into the larger implements (the refuse from which abounds near the pits) on the spot, while the more delicate varieties were finished in workshops by the river's bank. The manufacture must have been on an immense scale. The products of the art lie scattered far and wide over the heaths and open spaces of the neighbourhood, from the exquisitely finished arrow-head to the rude wastes thrown aside as useless before its completion. It is a pet theory of the writer's that the old Broomhill fair, till recently held on a barren waste within easy reach of these workings, was a survival through British and mediaeval times of a pre-historic market for flint cutlery. And the gun-flint itself, as it leaves the hands of the "knapper," affords some support to this theory. It is merely a specialised "strike-a-light" and the "strike-a-light" (in its oval or discoid form) is practically identical with the so-called scrapers of neolithic times. These "scrapers" are found in large quantities round Brandon, and are generally supposed (as their name, indeed, implies) to have been used in dressing skins: but Mr. Evans, in his work on "Ancient Stone Implements", points out the extreme probability that some of them, at all events, were made for the purpose of obtaining light, either from knobs of iron pyrites, or later from iron itself: and if this is admitted, a perfect pedigree has been made out for the gun-flint of to-day. Originating with the earliest savage who hit on the notion of using a splinter of flint for the tip of his rude javelin; organised and developed by the neolithic excavators of Grime's Graves; kept alive during long centuries by the continuous demand for "strike-a-lights", after its more costly productions had been superseded by bronze and iron; revivified and remodelled by the invention of fire-arms; dwindling once more from the effect of the further invention of percussion caps, and now subsisting on the precarious charity of [Africans], it would seem to have well-nigh completed the cycle of its existence. But some hope yet remains for it. There is still one loophole of escape from the narrow conditions under which it pines; and to point out this possibility we will devote what is left of our space. Alongside the manufacture of "strike-a-lights' and the gun-flints there has existed at Brandon since the middle of the fifteenth century the art of producing ornamental work for architectural purposes. Up to 1450, or thereabouts, it seems not to have occurred to anyone to use flints for building except in their rough natural state. About that date, however, owing to the great extension of trade in Norfolk and Suffolk which followed the Wars of the Roses, a sort of religious mania for church-building set in, and the architects of the period, casting about for a mode of decorating their walls, conceived the idea of shaping and dressing flints for that purpose. 14th century flint work at St. Ethelbert's Gateway in NorwichThe discovery once made, the new fashion spread like wildfire, and as one church after another, reared by the wealthy wool merchants and shipowners of the eastern counties, took the place of the more modest structures of the Norman and Early English periods, each builder vied with his neighbour in the intricacy and elaboration of his designs. Perhaps the finest specimen of squared flint-work in any building in Norfolk is to be found in the wall of the old Bridewell on the south side of St. Andrew's Churchyard, Norwich. The Thorpe Chapel in the Church of St. Michael Coslany, and the east end of the Guildhall in the same town, are two more notable examples; while the Town Hall at Lynn, and numerous churches in Norfolk and Suffolk, present the most exquisite varieties of this form of ornamentation. Mr. Baggallay points out in his paper that there are two distinct systems employed, one in which the flint forms a dark background for a tracery of freestone; and the other (as in a majority of instances) in which a stone wall is divided into panels filled up with flint. We have only room for a couple of illustrations One (here figured) represents a small crocketed shrine surmounting a crown with the letters I.H.S., which forms the central decoration of the church-porch at Forncett St. Peter in Norfolk, built about 1480; and has been chosen to exemplify the choicer designs of the best period. 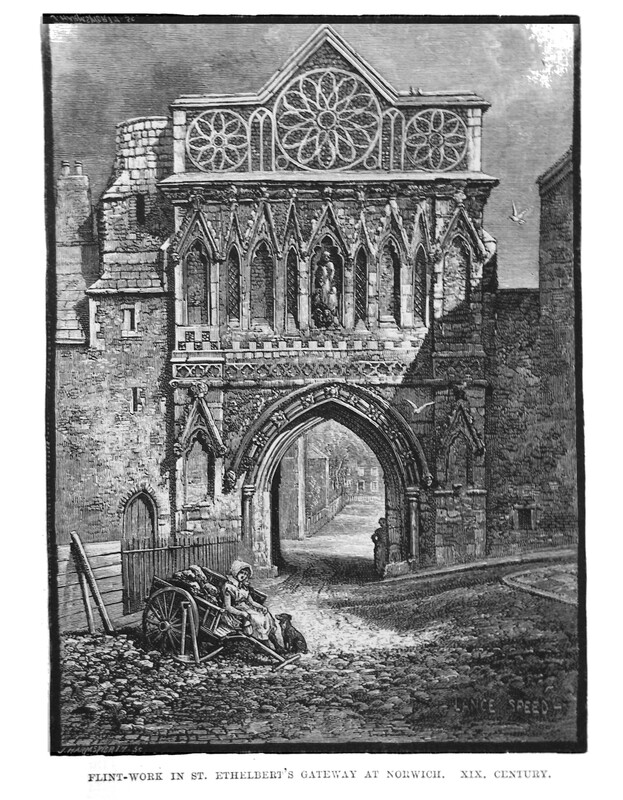 The other (p. 409) is of St. Ethelbert's Gateway, leading into the Close at Norwich. In this the decadence of the art is strikingly evidenced by the crude and commonplace geometrical tracery which fills the gable over the arch, and is the result of a "restoration" by the Dean and Chapter early in the present century. Architectural work of this sort is still occasionally in demand, and it is in this direction that a fresh development of the ancient craft can alone be looked for. If this almost forgotten branch of the art could be extended, as Mr. Baggallay pleads in his paper, and could receive new life from draughtsmen of artistic ability, its evil day might be indefinitely postponed, or perhaps altogether averted.